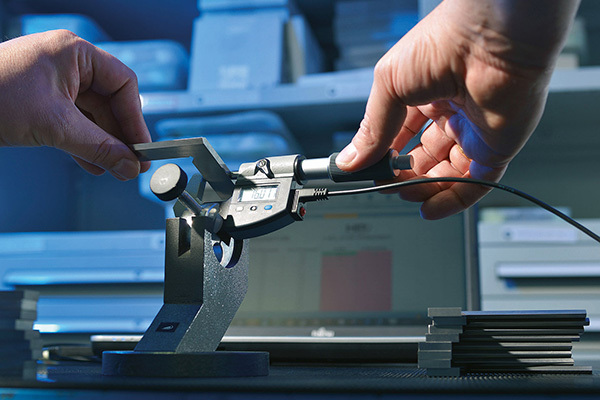 The production of hand-held measuring equipment often means large batch runs and high demands on product accuracy. In this context, the selected manufacturing technology is faced with the challenging task of working at speed and with a high degree of precision. With this in mind, the solution chosen by Helios-Preisser in Germany is aided by Blum touch probes, which are used in the company’s machining centres for integrating continuous measurements into the process. In 2008, Helios-Preisser, a manufacturer of hand-held measuring equipment for professional use, became aware that the capacity of its three machining centres was no longer sufficient. The company was operating around the clock in three shifts to manufacture its micrometers, vernier calipers, dial gauges, and marking and measuring instruments. Due to its positive experience with the company’s existing machine tools, Gammertingen-based Helios-Preisser opted to continue relying on machine tools from Heller fitted with Blum Novotest measuring systems. A 14-m long pallet magazine connects the company’s machining centres, which are supplied with clamped workpieces by a robot. Helios-Preisser employees already had many years of positive experience with Blum touch probes in the company’s previous Heller machining centres, which still operate with great reliability. As a result, a new Heller four-axis machine was also specified with a Blum measuring probe. 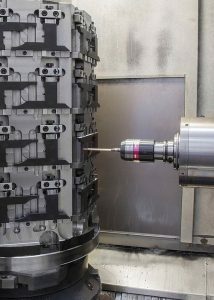 Only the company’s five-axis machining centre used a probe from another manufacturer, a fact that did not meet with great approval at Helios-Preisser. “Where possible, I endeavour to make regional purchases. In Blum, we have found a partner that can offer us high-quality products and corresponding service from a close distance – we like to have just one point of contact,” emphasises CEO Siegfried Lorch. “In addition, we have been extremely satisfied with the Blum touch probes for many years.” As a result, a Blum probe has since been fitted to the five-axis machining centre. With 120 employees, Helios-Preisser uses TC50 and TC60 touch probes from Blum. The former transmit data via infrared, the latter via radio technology. Each touch probe is fitted on a tool holder and can be substituted if necessary in order to execute measuring tasks before, during and after machining. The infrared system can be used when line-of-sight can be guaranteed between the touch probe and receiver. 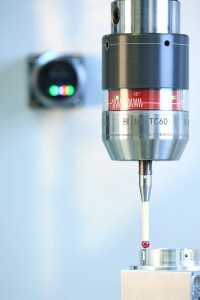 A measuring system with radio transmission is installed on the five-axis machining centre, which reliably transmits the signals from the touch probe to the receiver – even when the line-of-sight is disrupted by the large swivel head. Another example is the tailstocks of the company’s bench metrology centres. Here, a hole must be positioned accurately to 0.01 mm for a channel on the same part. Previously, there had always been fluctuations, often due to the temperature response of the machine. If the dimension was correct in the morning with a cold machine and shop floor, by noon, with a hot machine and warm weather, the dimension would be out of tolerance. The channel is now machined and measured before finally being drilled using the measurement data. This strategy enables the desired precision to be reliably achieved regardless of temperature. The large volumes manufactured in Gammertingen require short cycle times, so measurement must not take too long. Blum touch probes are designed for maximum measuring speed and are not sensitive to coolant, which is simply pushed away by the high measuring pressure. Measurements can also be taken directly after machining. “The touch probe is moved at a top speed of 60 m/min until close to the component; touching then takes place at up to 3 m/min – so not much time is lost,” reports Weber. “After machining, we check almost all fits using the Blum touch probe. If a machine determines that a tolerance has not been held, the pallet is automatically removed and placed in the company’s pallet store with an inspection record. The next morning it can be inspected to determine where the fault is and, in the meantime, the machine can continue to process further pallets.